I got a call from Junk to go for lunch at Dirty Ken’s restaurant downtown (not the real name). Junk picked me up, and we tried to find a parking spot downtown that wasn’t completely filled with snow. After we braved the snow filled streets and got parked, we found that the restaurant was closed. Our backup plan was Stella’s in Osborne Village, which was excellent as always. After breakfast we hung out for a few hours watching Simpsons, and then I returned home to prepare for the New Year’s Party at the fraternity house. Due to the crazy amounts of snow and the fact that I was planning on drinking too much to safely drive home, I took the bus to the frat house. Winnipeg Transit is not the best form of transportation, and it doesn’t even come close to Japanese trains, but it sure beats driving in the winter. The party was pretty good, even though only about half of the expected people showed up due to the snow. The people who did show up enjoyed a typical evening of alcohol fueled mayhem. Highlights included a live band in the basement, a sad female singing in Portuguese in the shower, communal baby duck, a cool projector, and getting to hang out with Hippie, who some of you may remember as one of the people who came to visit me in Japan in the summer. My good friend / drinking buddy Triple D showed up late from work, and we recreated some of our wrestling night stupidity by attacking each other with plastic champagne glasses. It seemed like a fun idea at the time, but we both ended up with cuts on our foreheads. Fun fact: non stick cooking spray in an open wound stings like crazy. Later in the evening Hippie, who was living in the fraternity house, retreated to his room with his girlfriend Sunny for some “alone time”. He left her alone in his room to have a shower, so Triple D and I (after way too many beers) decided to hang out with Sunny and interrupt their plans. When Hippie returned and found us hanging out, he was less than pleased. After much pleading and several threats, Hippie thought we were finally about to leave. At that moment, Triple D picked up some bongos and initiated an Epic Bongo Challenge. One of the cardinal rules of being a Hippie is that you must own bongos. The related rule is that you are never able to turn down a bongo challenge at any time for any reason. Triple D picked up Hippie’s bongos and played a pretty good beat, considering his blood alcohol content. Hippie took the bongos and responded to the challenge. I encouraged them both, and took the picture above. I honestly can’t say how long the epic bongo battle continued, but it probably seemed like hours to poor Sunny. Eventually we did leave the room and I ended up crashing on one of the many available couches long after most people had gone to sleep. It was a fun New Year’s Eve with friends that I was going to regret in the morning. 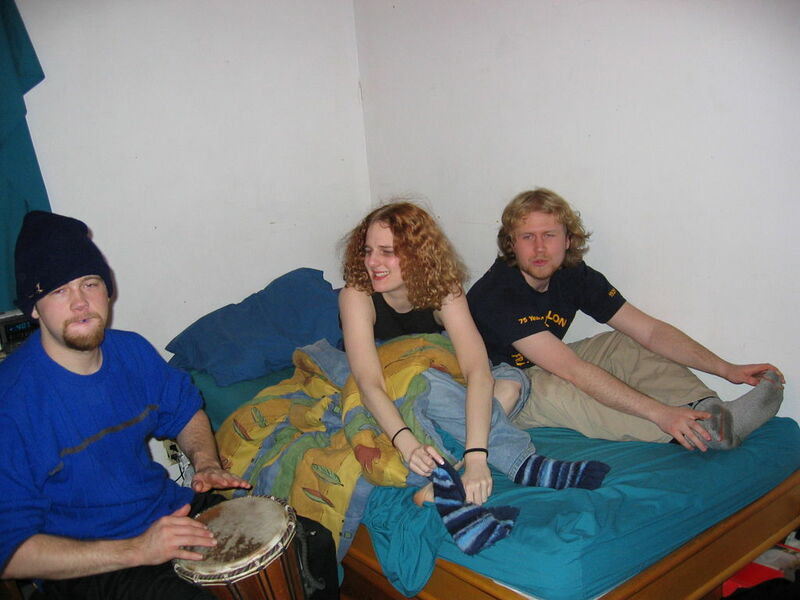 December 30, 2004 – Non alcohol karaoke!? Today it started snowing, and the snow didn’t stop. 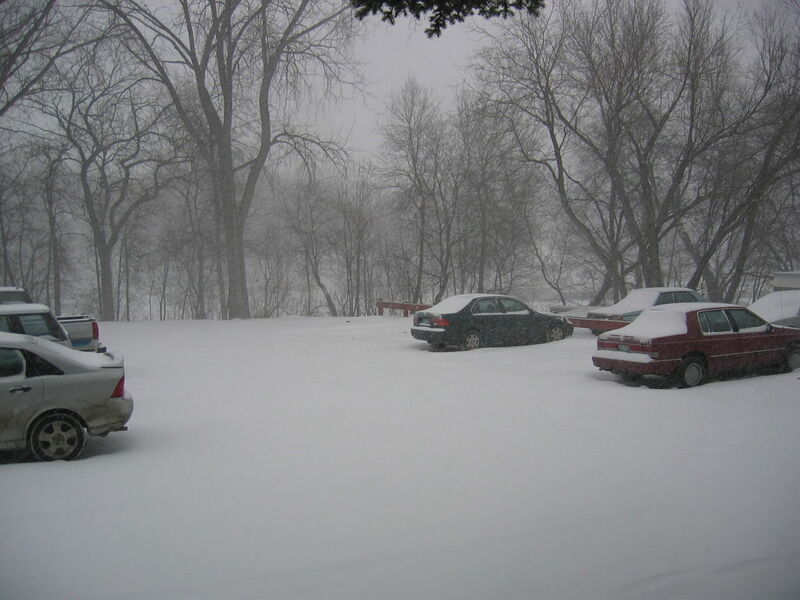 By the end of the day, some parts of Winnipeg had received more than 30 centimeters (about 12 inches) of Snow. Since I was only back in Canada for a few weeks, I didn’t want to let the weather slow me down. I had a full evening planned with friends. The first venue of the evening was Smitty’s lounge for their famous wing night. My friends and I all gorged ourselves on chicken wings and beer. Sometime around 2000 or 2001, my friend Grog and I discovered the joys of Smitty’s Tuesday and Thursday cheap wing nights. We invited more people, and wing night became a regular event. 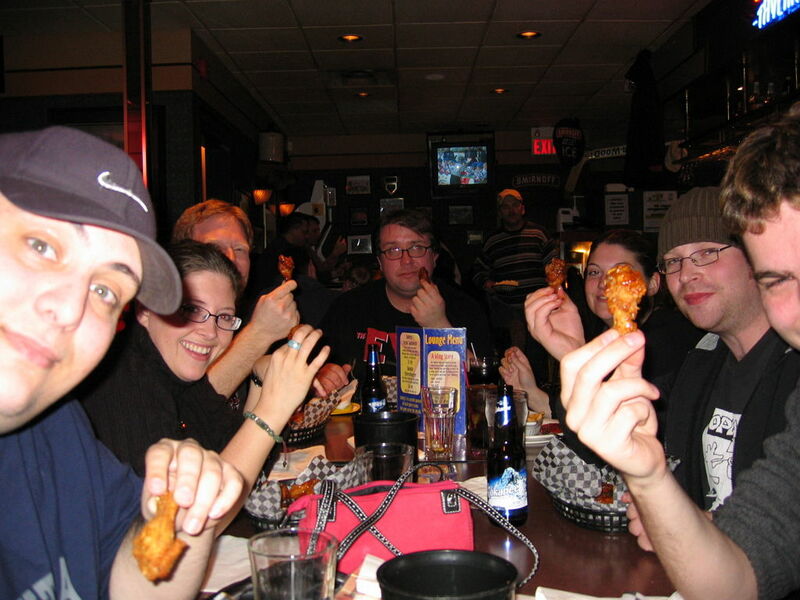 I am proud to say that the wing night tradition survived even after Grog and I both moved away from Winnipeg. Tonight’s wing night was the first time we were both back in Winnipeg for wings in over a year. After wings, we drove to Osborne village to find something fun to do. I was staying in my old apartment (now shared by my sister and a roommate) in the neighbourhood, so I was able to safely park my car and meet up with the group at a new karaoke place. It was Asian style private room karaoke, but they weren’t licensed to serve alcohol. I hadn’t realized before how important alcohol was to karaoke. We still had fun, however. My group had a few people who had been in some local bands, so the quality of karaoke was above my usual drunk English teacher level. We finished up with some beverages at Toad in the Hole, a popular pub style watering hold that has become a landmark in Osborne Village. It was a really fun night, and despite me being away for a year, my friends made me feel like I had never left at all. During the afternoon I met up with Brother X, one of my pledge brothers from when I joined the fraternity. Brother X was usually a pretty good guy, but had some bad habits that got him kicked out of the fraternity. We had been keeping in touch, so it was good to see him again. After catching up for a bit, we went to see Meet the Fockers at the cheap theater. MTF is a sequel to the hilarious “Meet the Parents”. It was disappointing. In the evening I met up with The Ex. When I had originally decided to move to Japan, we were having a lot of problems in our relationship. We had been together for about 5 years, but weren’t sure where the relationship was going. I wanted to have an adventure before I got locked into a career, and after studying Japanese in University, I decided a year overseas to teach English would fit the bill. It would be hard to describe the current status of our relationship. Ironically the word “complicated” is the simplest way to describe things. When I decided to go on an overseas adventure, I asked The Ex to come with me but she had no interest in living in Japan for a year. I asked if she was interested in coming to visit, but she wasn’t completely sold on the idea and was also planning a major trip to visit her cousins in Portugal. 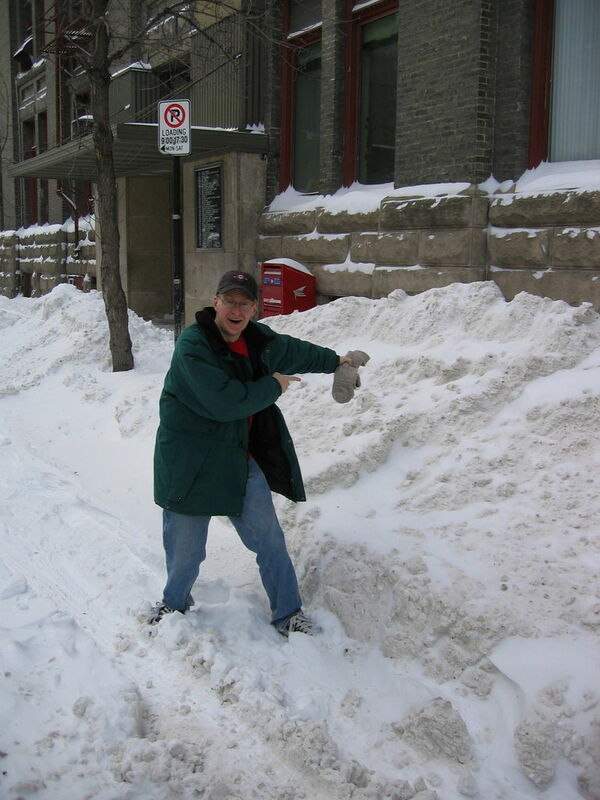 Before I left Canada, we had agreed to go our separate ways and to reassess the situation when I moved home. For the first part of my time away, we had exchanged some phone calls to keep in touch. We switched to emails to try and get some distance. The emails were generally friendly, but it was a strange situation that we were both having trouble navigating. My decision to stay longer in Japan was also a bit of a stress point. Before I left Japan, The Ex and I made plans to meet for coffee at Perkins while I was in Canada. We met in the entrance way and then moved to a table. It was strange to talk to the woman I had been in a relationship with for 5 years but hadn’t actually seen in a year. Things started reasonably well; we hit the safe topics – catching up on how our mutual friends were doing, and exchanging some of our current adventures. The topic then changed to relationship stuff. She told me that she had been dating a coworker for several months now, and made a point of telling me that he was really tall. I told her that I was dating The Penpal (which understandably got a negative reaction), and that my parents had already met The Penpal’s parents. One of my biggest complaints about my relationship with The Ex was that in the 5 years we were together, our parents had never met each other. I’m not really sure what either one of us was expecting out of this meeting. It was an extremely awkward situation and one of my least favourite trips to Perkins, but I think we both walked away with a bit more closure than we had before. Perkins was close to Cinema City 8, the discount movie theater. Instead of being left by myself to over-analyze the uncomfortable conversation I just had with The Ex, I met up with my sister and we went to see Napoleon Dynamite. The movie was a collection of loosely related events in the lives of some very strange people in Idaho. It was weird and funny and very quotable. 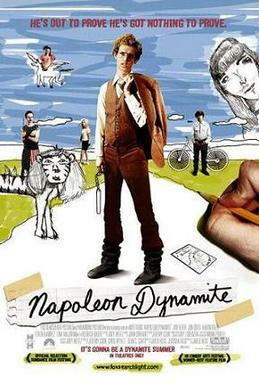 Napoleon Dynamite was a good ending to a day with some uncomfortable moments. 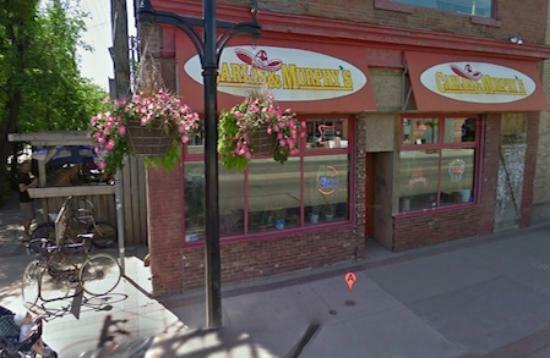 Today I went to Carlos and Murphy’s for some of their famous nachos and beer. It was great! It’s hard to find a giant plate of greasy, cheesy nachos in Japan. I did a lot of shopping in Winnipeg today. After spending hours in the mall, I realized how much I miss Japanese Customer Service. If you only ever shop in Canada, you don’t realize just how good service can be. I found that some clerks just simply had no interest in serving customers at all. In Japan I have had great service in almost any place where I was a customer. Staff will do their best to help you, even with a language barrier. Restaurant servers are fantastic even though they don’t get tips. Japanese customer service truly raises the bar for everyone else. The worst offenders on my return home so far have been Sport-Check and Roots, where the staff had no interest in working at all. I am not sure if they were unhappy to be working in busy stores over the holidays, or if they just didn’t like their jobs. Getting any help at all was a major imposition. Those clerks would have been fired in Japan immediately. Koya, Moore’s, Robin’s Donuts and Osborne Cyber Cafe (where I am now) haven’t been very good either. To be fair, I have gotten some great service at Carlos and Murphys, Olive Garden, Applebees, Lens-Crafters and The Liquor Mart. Well done folks, well done. I spent several hours at Polo Park mall shopping with my mom. By the end I was tired and grumpy, and just wanted to leave. If you are living away from home and only have limited time to spend with your family, spend that time doing something you both enjoy. Shopping was a poor choice and I wish I had just played a few intense games of Scrabble instead. (2014 Update) Please remember that these posts happened 10 years ago. I make no assertions about the level of service you will receive in any of these stores now. Even if the service has improved, it’s still probably not as good as service in Japan. Seriously, I miss Japanese customer service. For those unaware, Boxing Day is the name given to December 26 in British Commonwealth countries. In Canada, it is one of the biggest shopping days of the year. Stores are usually open for reduced hours, and many offer big discounts or door crasher sales. I didn’t line up early for any of the insane deals, but I did go to WalMart with my family to see the regular boxing day sales. The store was overcrowded and it took forever to get through the lines. Everyone was paying with plastic, and the machines were very slow. Unless you are a die hard shopper, I recommend against shopping on Boxing Day. 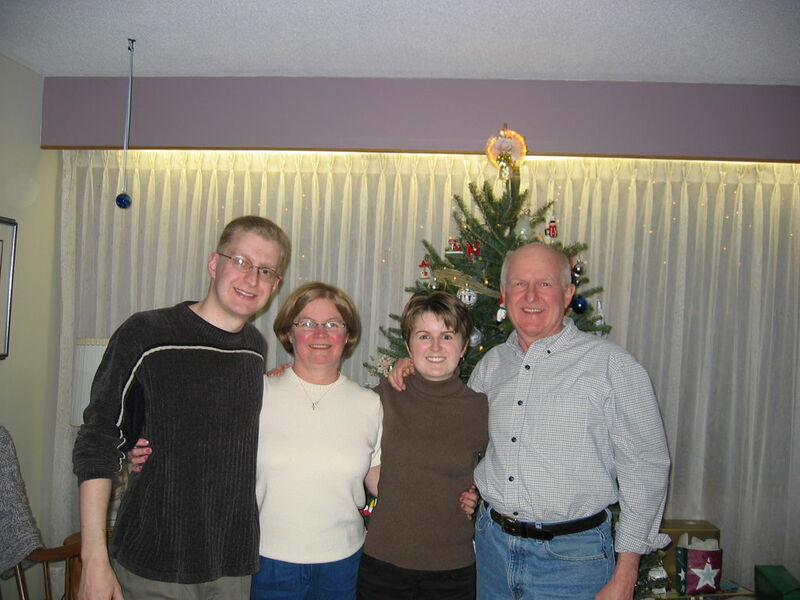 December 25, 2004 – Merry Christmas! It was great to be home for Christmas! My Christmas day was like any other – opening presents in the morning followed by a big breakfast cooked by my Dad. Afternoon was filled with phone calls with relatives and napping, and the evening featured a huge turkey dinner. One of the presents I got was the first season of “Corner Gas” on DVD. Corner Gas is a Canadian TV show set in the fictional small town of Dog River, Saskatchewan. The show can best be described as Seinfeld if it was set in Saskatchewan instead of New York.